o For every 1 percent increase in the national participation rate by mail, the Census Bureau saves taxpayers $85 million by not having to send census takers door to door to households that failed to return the census form. If every household mailed back its 2010 Census form, taxpayers could reduce the cost of taking the census and save $1.5 billion. o It costs the government just 42 cents for a postage paid envelope when a household mails back the form but costs on average about $57 per household to send a census taker. 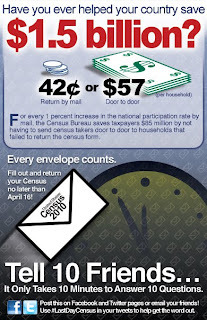 o April 16th is the last day to return your Census form! Disclaimer: I was not compensated in any manner for posting this information.